Can I just say how mad I get every time I see a car commercial these days hyping an MPG in the 20’s as being good?!?! That’s crap mileage. I don’t care if it is an SUV. 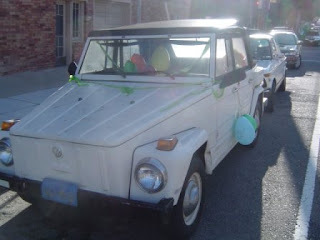 My 1974 Volkswagen Thing gets an MPG in the 20’s. Are you honestly claiming there have been no major advancements in fuel economy in 34 years?!?! My car is made out of metal, not fiberglass or plastic. It’s f-ing heavy, and it’s not very aerodynamic. I don’t think that Volkswagen even discovered the concept of aerodynamics until the late 90’s. So if my ancient, rock of a car that moves through the air like a giant sail can get an MPG in the 20’s, it’s criminal that any car on the road today isn’t getting better mileage than that. The American automobile industry deserves to go under if it can’t grasp the fundamentals of its own market. I don’t care if you think global warming is a myth. Global warming means nothing when gas is between $3.50 and $5 a gallon. Did Detroit learn nothing from the late 70’s? Apparently not. And it was so nice to see a picture of The Thing again. Dude, I KNOW! I drive a ranger, a crappy, 4 cylinder manual ranger with a shell and I get better mileage than that!